Latin Love is, in equal measure, the best and the worst thing in the world. Whether you ask a Latin American person or a foreigner they’ll often say the same, and gender makes no difference either; universally, Latin Love is known to be a unique phenomenon that has the power to change your life forever (or for a couple of weeks at least). I learned this while dating in Colombia. If you’ve ever experienced it, you’ll know exactly what I’m talking about. But if not, lemme break down the three main stages for you. I’ll tell you about my own experiences in a second, but here are some tales from other folk first. 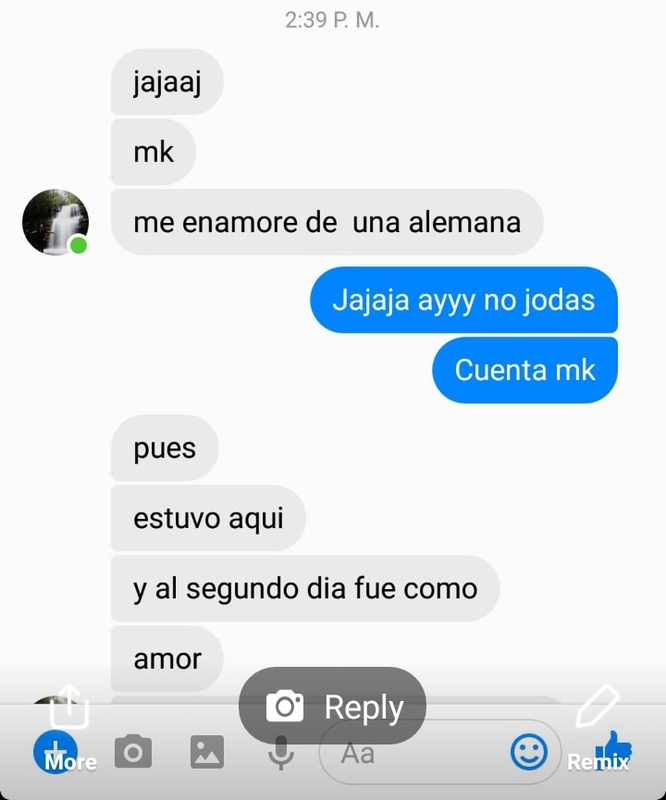 For any of you that speak less Spanish than me (is that even possible), this dude is saying that he fell in love with a German girl after two days. That’s stages one and two, right there. Another mate from the US was at the end of his year-long trip to South America when he got stood up by a Latina he met on Tinder. But he had a good feeling about her despite being ditched and decided to give her a second chance. They arranged to meet for breakfast the next morning and this time she actually showed up. What ensued was the greatest Latin Love story ever told. He went back to the States to make some $$$ and they continued to talk every day. And now, having never even kissed, they’re in a proper official relationship and he’s heading back to Colombia to shack up with his Costeña cutie later this year. OMG I LOVE IT SO MUCH THIS WOULD NEVER HAPPEN IN ENGLAND. My own Latin Love story began with being dicked around by a tattooed dreamboat for four months. I already told you about him in this post and this post, so if you haven’t read them yet go ahead and indulge me: it’s worth it for context. When I left Colombia for the UK I’d given up all hope of ever hearing from him again. But suddenly he starts blowing up my celly, telling me he misses me. Then, he tells me he loves me. Yep, he told me he loves me over Whatsapp. I don’t believe him though, how can he love me when he doesn’t even follow me back on Instagram? But, now when he sends me GIFS and photos, they’re of him blowing kisses and being silly instead of, well, you know. Surely that’s a sign of his growing affection? He’s also asked me not to get married before we see each other next. Erm, ok pal, I’ll try not to. And speaking of seeing each other next, all of a sudden he’s decided that he’ll be in Mexico at the same time as me next year. And, in a classic Latin Love move, he’s also decided that we should get a place together while we’re both there. Not too shabby for what began as just another Tinder experiment. That’s a little too much for this gringa. Like, sure I wanna kiss his mouth all day long. But, do I wanna wash his socks and make Spanglish small talk every day? Probs not. Listen up, Latin America: I have an idea. Your governments should issue two-month Latin Love visas to foreigners because these romances are tough to keep alive for longer than that. Then, if you do make it past those first two months, you get citizenship for life. I mean, you deserve it if you’ve managed to survive the greatest/most challenging love on Earth.